Building a house is no easy task. This statement is obvious and understandable both for a professional builder and for a person who is familiar with the question only superficially. In this case there are no trifles, and each of the stages of construction requires careful study and many years of experience in the practical application of the knowledge gained. And although, thanks to the development of technology, the production of many materials and the improvement of tools, work is greatly facilitated, some stages represent a task that is feasible for implementation only by a person who really understands the essence of the material. It is especially important to figure out how to install rafters on the roof. Immediately it is necessary to make a reservation that if there is no proper experience in conducting such work, then it does not make sense to undertake it. But on the other hand, any experience is a matter of time, and the essence lies in the knowledge, so to study the question, at least in theory, would not be superfluous for sure. For a start it is necessary to say a few words about what rafters are. So it is called the main element of the roofing system, which is a long bars, arranged vertically and at an angle to the walls. It rafters are the original basis of the entire roof. On top of the rafters, its main elements are mounted, which means that errors made during the installation of the truss system will lead to a violation of the installation technology and the rest of the roof. In simple terms, improper installation of rafters - this is the current roof. That is why the question of how to correctly mount the rafter system is of paramount importance when it comes to the roof of a house. 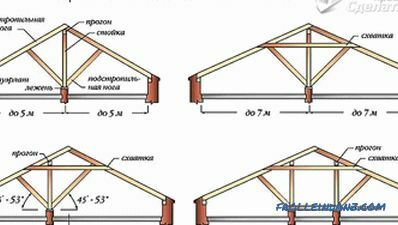 Speaking of installing the truss system is necessary Note that there are two main technologies for performing the task. These technologies are significantly different from each other, so it is sufficient to consider each option individually and in more detail. Suspended rafters are such roof elements which, when installed, in addition to the point of support on the mauerlat and between themselves, provide for the installation of special racks on which they will also rely. The result is that the resulting stresses and subsequent mechanical loads exerted by the other elements of the roof are evenly distributed and mutually compensated. 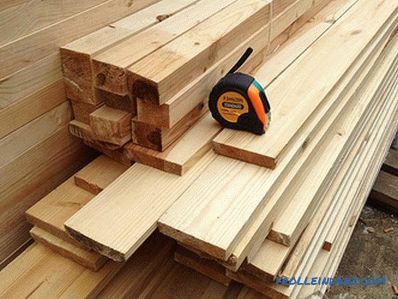 As regards how to install the slats on the house, it is useful to know that there are several ways of installation. 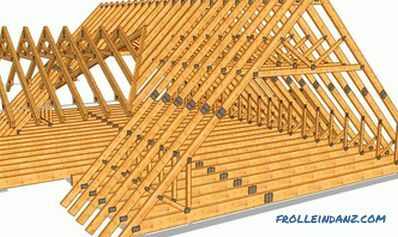 The main differences relate to the methods of fastening the rafters to the mauerlat and connecting the rafter legs to each other. First used as rafter legs, the bars must be prepared. 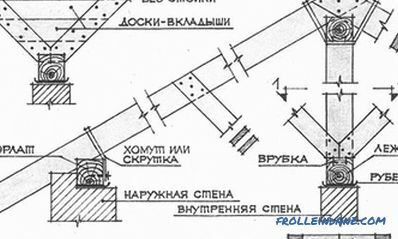 The point is that in the place of their contact with each other, it is necessary to choose half the thickness of the bar so that when joining the rafters with each other, they are strictly in the same plane, having no displacements. In addition, special cuts can be made at the junction of the rafter foot and the power plate on the rafters, which will help ensure that the supports do not disperse. At the top of the rafter, in addition to fixing with each other, they are attached to an additional support - a longitudinal bar, which is laid across the direction of the rafter. Thus, the rafters are firmly fixed already. Further, the truss legs can be additionally pulled together at the top or bottom, and possibly in both places, if the situation demands. But if we speak directly about the methods of fastening rafters, there are also many options. For this purpose, construction brackets can also be used (conveniently for fastening the rafters to the power plate), various auxiliary struts and screeds, as well as steel fastening plates and the like. 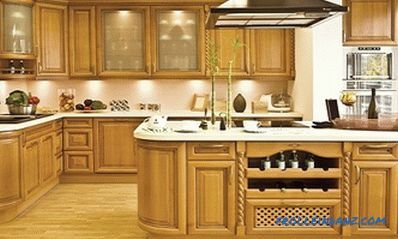 As a consumable mounting material can be used screws, studs, wooden wedges, the above-mentioned brackets and, in general, everything that will allow the situation and experience of such works. 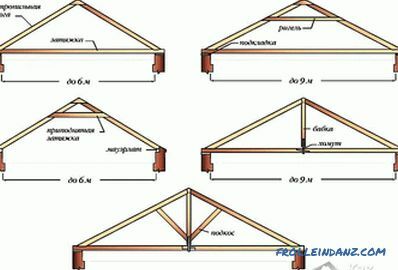 Another option for making truss system is a home installation of hanging trusses. By and large, the installation process of supports using this technology may resemble the above, but this is not quite true, for a number of reasons, one of which is that it is not necessary to install a central support, such as the one described above, for installing hanging rafters. 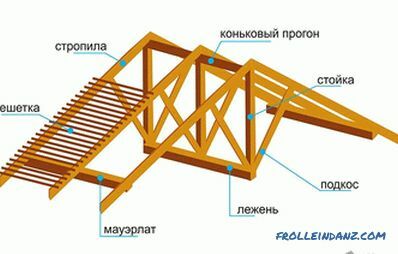 The rafters are interconnected with the mauerlat, so it turns out that they hang on the frame of the house.This, to some extent, simplifies the work from the technical side and allows the truss system to be mounted on houses that do not have a central load-bearing wall. First, the bars are interconnected. 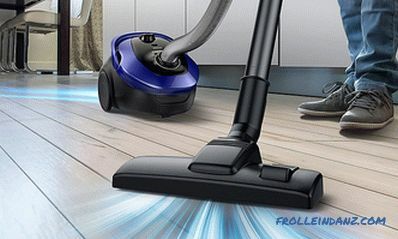 At this stage it is necessary to ensure that the connections are even and durable. Then the established truss legs set on top of the frame and secure. It is important to understand that this process may seem simple only from words, since it entails not only the application of physical effort, but also the application of a sufficiently large amount of knowledge and skills, possession of which far from everyone can boast . The fastening of the rafter legs to each other can be done, as in the first variant, in several ways. For example, you can pull the rafters between each other with a horizontal bar at the bottom, just above the level of the mauerlat or, on the contrary, you can equip an additional screed above, closer to the descent of the rafters. And you can combine the options that only adds to the design strength. But it is important to remember that any excesses are not good for the cause. The greater the number of additional elements the truss system will have, the more weight the entire roof will have, which means that the load will be greater on the walls as well as on the foundation. Another way to further strengthen the hanging trusses is to equip them with a special support post called the "headstock". First, the truss legs are pulled down with a bar at the bottom, and then, using this beam as an element of the support, a vertical support is installed. In addition to the "grandmother", you can use angular thrusts, but it is important to remember that for the reasons described above, too much interest in backwaters is inappropriate. 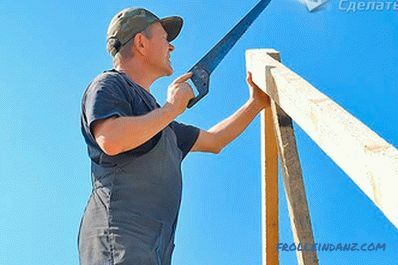 To end this, you can add that it is in principle possible to install rafters with your own hands. However, for this it is necessary to have both knowledge and experience, and if they are not, then it is better to entrust the work to professionals, and for acquiring knowledge you can limit yourself to the “position” of an assistant. Among other things, as a source of additional information on topics of interest, you can use the appropriate videos that will help to understand the essence of the issue and clearly demonstrate the upcoming process.